The Chris Moyles Show and Breakfast Dilemma Chris Moyles is good and so is his team. They’re not young but they’re youthful and fun. Noone currently needs to take over the breakfast show (especially not Greg James) so stop talking about it. This is all. Keep doing what you’re doing Moyles. 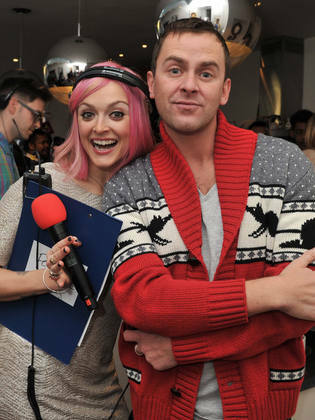 Fearne Cotton Cotton has the rare combination of being quite boring but also really sure of how great she is. In as much as she is positive and chirpy and generally welcoming, noone can listen to her for more than ten minutes without smacking themselves over the head with a casserole dish to make it stop. R1 needs to carefully calibrate their rations of indie tracks:Fearne talking about boring non-events during the 10am-1pm show so as not to kill off their target audience. Also Fearne needs to be banned from talking about Celebrity Juice all the time and have a limit on how many times she can mention cake and her boyfriend. We should also stop letting her pick ‘indie tracks’ and give the Live Lounge to someone who is competent.